What Do You Mean, Life Isn’t Fair? “What do you mean, ‘it’s not going to be fair’, Mom?” my eldest daughter asked. That weekend we hosted an Easter egg hunt and champagne brunch for several of our close friends and their children. My eldest Kung Fu Kid was so excited to have her friends come over, and yet she was very caught up with the concept of “fairness”…she wanted to make sure that the hunt was “fair” and that everyone would find the exact same number of eggs. At all of the local Easter egg hunts here in the Bay Area, the “competitions” are managed so that each child is only allowed to find a certain number of eggs, usually three or five. This makes it “fair” for everyone, and no one leaves disappointed. Today, kids are often brought up to avoid any exposure to “bad” things like “failure” or “disappointment”. At school, if you bring a Valentine, you must bring one for the entire class. If you pass out invitations at school, you need to invite everyone. While I admire the fact that no one wants to disappoint a child (I don’t either–I’m not an evil meanie! ), unfortunately this doesn’t prepare them very well for real life as an adult. Because (as we all heard our parents tell us when we were little), life isn’t “fair”. Believe me, I really wish it were! I wish that everyone could participate in “accredited” investments, and that everyone in the world had enough to eat, all of the time, and that no one was ever disappointed or scared or sick or sad. I truly wish that with all of my heart. But unfortunately, that’s not the way the world works. The world we live in rewards hard work and perseverance, followed by more hard work and more perseverance, followed by (you guessed it…), more hard work and perseverance! And if you really want to stack the deck in your favor, you need to throw in a little planning and strategizing along the way. That is the path to success, and of course what we all want for our children. So back to the Easter egg hunt–I hope we taught our daughter an important lesson. After much discussion with her and with the other parents coming, we decided to go with our original plan, the “free-for-all-scrappiest-hunters-get-the-most-bounty” idea. Because that is how the “real” world works (and it’s also a lot more fun). Our daughter was so nervous before the hunt. She wondered if she would get as many eggs as her friends, wondered if she would find any eggs at all, and worried that the eggs that she did find wouldn’t fit in her basket. But I am happy to report that our egg hunt was a resounding success. 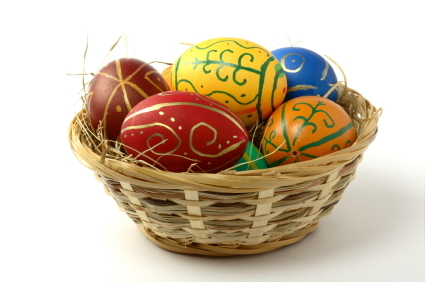 And the strategies that we used to help our daughter successfully find a lot of Easter eggs are the exact same strategies that you can use to become a better investor. It is a big, wide, wonderful world out there filled with more than “enough” money and resources for everyone! Likewise, I feel the same about money and investing. There is plenty of money out there just waiting for you to discover it (heck, we’ve printed trillions of dollars in the past few years alone). But seriously, knowing in your heart that this is true and that the world is filled with abundance and value gives you the confidence you need to embark on a quest where you don’t necessarily know what the outcome will be, which is every day when investing. We talked with our daughter before the egg hunt, and with all of the children, and let them know that there were more than enough eggs for everyone (they were all nervous about it as they are so used to everything being “fair” all of the time). Because of this simple step, instead of complaining and worrying that it wouldn’t be “fair”, they confidently took off and ran around the yard and every single child’s basket was overflowing by the end of the hunt. One little girl even came late and still found enough eggs to fill her basket. Before the egg hunt, we sat down with our daughter and asked her what her strategy was going to be for finding the most eggs that she could. At first she didn’t have one other than to “run really fast and look really hard” but we tried to get her to elaborate on that and to formulate a better plan. We asked her if she was going to follow all of her friends and look where they were looking, or if she would strike out on her own and go where she thought the best chance of finding eggs would be. She thought about it for a minute and finally replied, “I’m going on my own”. And sure enough, by following her own path and not just running around behind all of her friends and picking up their scraps, she was able to find a ton of eggs in a very short time-period. This is rather like investing in “sanitized” investments such as your 401k…you are simply “doing what everyone else is doing” and picking up the scraps of the massive Wall Street financial machine. Instead, I hope you will formulate your own alternative investing strategies that will yield you higher profits, like buying gold and silver bullion, investing in income-producing real estate, betting on foreign currencies, and many other so-called “alternative” investments that we cover here on Kung Fu Finance. If you settle for the “average” strategy (“invest in your 401k”, “buy and hold stocks and mutual funds for the long-term”) you are guaranteed to get average results. But the more “smart money” strategies you can learn, the more you stack the deck in your favor and the more likely you are to succeed. Those who succeed in life simply have better strategies than those who struggle. Now, in the investing world there is such a thing as “insider information”, which of course is illegal, and that is not what I mean here. However, it is true that the better your information is, the more likely you are to be successful. As the adults were drinking champagne (we are all about fun and education here at Kung Fu Finance and in our Kung Fu Family…) and hiding the eggs, I noticed many of the children “peeking” out the windows from our porch. This is a basic human instinct and it’s a good one. They were simply trying to improve their access to information so that they could gain an advantage in the egg hunt and be successful. You should work on improving your information, too, because believe me, everyone else is! Life isn’t fair as much as we might wish it to be, and right behind having a great strategy comes having the best information. Now I don’t mean to say at all that I condone “cheating” or “peeking” or somehow illegally getting access to “insider” information (I certainly do not), but it is true that the better your information, the better your chances are of success. Play by the rules, stay within bounds at all times, but continually work to legally and honestly improve your access to information, and watch your financial prowess soar. In general, do you want to play where the deck is stacked against you, or play where you have the advantage? If you are playing to win, I think you’ll agree that you want to play where you have the advantage. How can you gain an advantage in your investing? Can you go after an asset class where you have more control? Can you learn new and better strategies to give you an edge? What can you do to give yourself an advantage? I would love to hear the strategies that you are pursuing in the comments that are outside the typical “mainstream” advice. In closing, life isn’t “fair”, although we of course would like it to be and try to make it as fair as possible for ourselves and for our children. Instead, you need to do all that you can legally and honestly do to stack the odds in your favor. That is what I try my best to do here at Kung Fu Finance for you–give you better information, better strategies, and alternative ideas and viewpoints so that you can be the very best investor that you can. Here’s to being a successful, scrappy, winner-take-all investor. Go on out there and stack the deck in your favor. We’re about to find out that life isn’t fair, but we should look on the bright side of things. Keep your head up! It’s easy to get down on yourself, but don’t let a bad day or mean person get you down. Learn from your mistakes and stay motivated by focusing on your long-term vision. Bette Tomaszewicz has a background in growing companies because she’s a risk-taker and knows how to take innovative ideas and turn them into profitable ventures. Her ability to build and manage top organizations has made her one of the most sought after women in the training and e-learning industry. Now at the helm of Glazer-Kennedy Inner Circle, Bette has increased the company’s focus on serving female entrepreneurs. Just recently GKIC held their first ever female-focused Business Makeover event in San Antonio, Texas to help their members move forward on the path to their American Dream. Bette’s also recently started a women-in-business teleseminar series. You can get free access to the monthly calls here.